Fear for their first interaction at work, their first outing in the real world. Why am I so pessimistic? Because this generation of university students, sometimes referred to as snowflakes (and with good reason), is the most risk averse, inward looking, intolerant, over-sensitive, bunch of self-righteous wimps I’ve ever come across. Fancy Dress parties especially if you plan dressing up as the Village People, Tarts & Vicars, chavs, gangsters, Pocohantas, camp men, Arabs or Mexicans. Presumably dressing up as a toff and burning £20 notes is OK in some quarters? Posters showing women’s bums or cleavages (a disciplinary offence). Wolf whistles, innuendos, or making offensive sexual noises. 24% have safe space policies which censor free speech. There are only three universities where that which is banned is actually illegal. Which means the rest is down to sheer intolerance. And yet no doubt these are the people crying over Brexit because it means we are being horrid to foreigners! Oxford university encourages students to report inappropriate fancy dress parties (learning from the Stasi) and discourages cross-dressing as it upsets trans-identified students. It also banned a student magazine called No Offence which celebrated free speech. Clearly you don’t want to leave Oxford more open-minded than went you went in! At some universities students can be disciplined for not addressing transgender students by their correct name or correct gender pronoun. With the wide spectrum thrown up by gender fluidity it raises the question of how you would you know what the correct gender pronoun was. Should students wear badges or tattoos declaring how they identify themselves? Oh, didn’t the Nazis try that kind of thing? The editor of Spiked, which has monitored free speech in universities for the last three years says “Campus censorship is about more than the so-called snowflake generation throwing its weight around, a coddled cohort treating the university like an oversized creche. Its just that after decades of liberalism in our universities we suddenly have students unions dictating how people should behave. Just like the extremists they are frightened of. And a lot of this started in America. The University of California’s Berkeley campus was where the free speech movement demanded that the university lifted a ban on political activity on campus. Fifty years later they suffered violent riots as students sought to ban a gay Brit, Milo Yiannopoulos, who was a pro-Trump conservative from speaking at all. They succeeded but also succeeded in propelling his book Dangerous up the best-sellers list. He is critical of Islam and rude about feminists and the left but there is no evidence he is a white supremacist or a fascist. Sounds OK to me. I’m not saying that it’s wrong to ban all the things mentioned above but the idea of cultural appropriation for example is often twisted out of proportion. For example East Anglia bans a mexican restaurant from giving out sombreros. Go to Mexico and all the street markets sell them to tourists. So how does that work? Is the Mexican restaurant actually abusing its position and stealing from a minority group? Should only Mexicans be allowed to cook mexican food, Chinese to cook chinese food and so on? And other european countries don’t seem to have been infected by snowflakes yet. 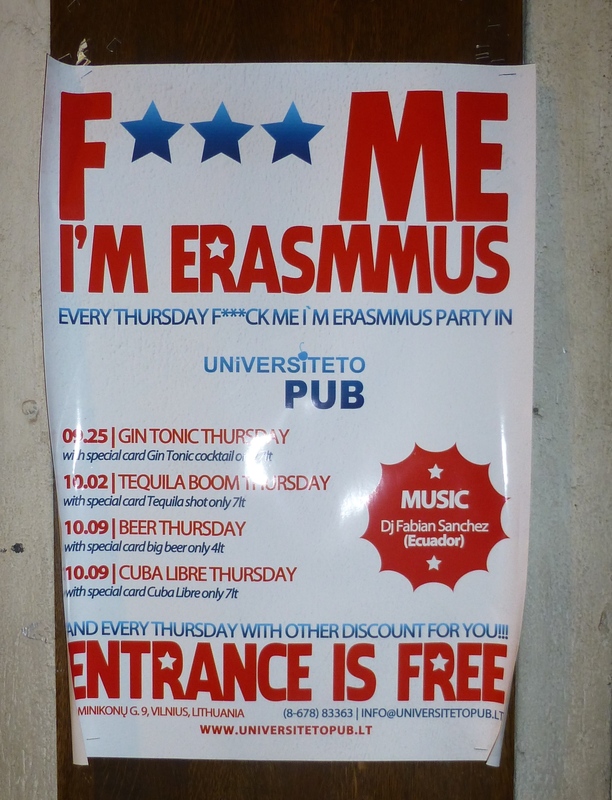 Have a look at this poster for a weekly party for Erasmus students! Categories: Education, Happiness, Lifestyle, Relationships, Work | Tags: censorship, Dangerous, Erasmus programme, free speech movement, Milo Yiannopoulos, no platform, safe spaces, snowflakes, Spiked, students, students unions, undergraduates, universities | Permalink. It’s been claimed that the educational exchange programme, Erasmus, has contributed to 1 million births since it began in 1987. 27% of participants met their future partners during their stay abroad and one third ended up with people of a different nationality. I was on a Summer School in Lithuania with a group of them back in 2008 and they certainly knew how to enjoy themselves the students from Poland, Germany, Turkey, Czech Republic, Latvia, and some other EU countries. European Commission spokeswoman Pia Ahrenkilde Hansen said it was a “touching little figure” that showed the scheme “creates a lot of positive things”. “It is a great encouragement to young people to go and live abroad and open up to all the opportunities that exist if you are willing,” Hansen added. I couldn’t have put it better myself! And they still seem to be celebrating those inter-cultural experiences here in Vilnius, Lithuania. Categories: Education, Health, Relationships | Tags: births, educational exchange, Erasmus programme, EU, Lithuania, Vilnius | Permalink.